In the last two weeks alone, Warren has run 401 separate digital ads on Facebook, seen by as many as 10 million people. WASHINGTON — Senator Elizabeth Warren bent the rules of presidential flirtation last month when she said she’d take a “hard look” at a 2020 White House campaign after she completes her reelection bid next month. But Warren’s actions, in particular her spending on digital advertising, show she’s already looking at 2020. Hard. Warren has emerged this year as the third-highest spender on digital ads — behind only President Trump and Beto O’Rourke, a Texas Democrat who is running in the country’s highest-profile Senate race. Unlike O’Rourke, Warren’s Senate race is not competitive. And unlike Trump, she’s not president. But her national aspirations are spurring her to get an early start on laying crucial groundwork for a potential White House bid. Part of that job entails expanding her footprint across the country. And that footprint is not just digital. She is peddling Warren merchandise on the Internet customized for voters in all 50 states. She’s dropping into states to help raise money and stump for allies in critical contests. The Globe, along with the Center for Responsive Politics, a nonpartisan Washington clearing house for the study of campaign spending, used newly available data from Facebook to take the first look at Warren’s digital advertising strategy. The review revealed how Warren has mounted a robust effort that’s caught the attention of her potential rivals for the Democratic nomination and drawn the ire of the Republican challenger in her Senate race. In the last two weeks alone, Warren has run 401 separate digital ads on Facebook, seen by as many as 10 million people. These aren’t all geared for Massachusetts: Her ads are getting four times as many eyeballs in other states. Especially noteworthy is her use of Facebook advertising in Oklahoma, the ruby-red state where she grew up. It is a key part of her middle-class biography, a place she’s likely to highlight a lot more if she runs for president. The majority of those seeing Warren’s digital ads on Facebook are being asked for their e-mail addresses and not money, according to the analysis. That means Warren is building a national list, not a war chest. At least so far. Many of the digital messages Warren has sent are off the news, including pleas to provide an e-mail address as a way to “sign up” and oppose Brett Kavanaugh’s nomination to the Supreme Court, lauding women’s rights, or supporting Special Counsel Robert Mueller’s investigation into the possible ties of Donald Trump’s presidential campaign to Russia. Warren also occasionally sends out video of herself speaking directly to the camera on an issue. It’s a trendy technique, with Trump doing similar weekly videos. “The earlier you start building, the better your position if you decide to run,” Pennington observed. Warren has spent at least $2.4 million on digital advertising through mid-September this year, according to the Center for Responsive Politics. Trump spent $8.6 million in the same time period and O’Rourke spent $4.7 million. Not everyone has taken the approach of spending money early on a digital infrastructure. Senator Bernie Sanders of Vermont, for example, did not build up his e-mail list in the months before making his bid for the 2016 presidential bid. That put him at a disadvantage, former aides say. For Warren in 2020, getting a big head start could be key to contending strongly for the nomination and nudging ideologically like-minded adversaries, such as Sanders, to the sidelines. There are other signs of Warren’s pre-presidential prep. The merchandise being hawked at her online store includes T-shirts branded with all 50 states plus Puerto Rico and the District of Columbia. (Warren, a dog lover, is also selling pet collars.) She’s donating money to all 50 state Democratic parties and has traveled to such places as Nevada and Wisconsin to appear on behalf of Democrats. She is seeding state Democratic parties in the early primary and caucus states of New Hampshire, South Carolina, and Nevada with former staffers who will presumably be loyal to her. She has released 10 years worth of tax returns. She’s even started softening with the Washington press corps, giving Washington-based reporters interviews in Senate hallways after years of marching past without pausing to answer questions. “We punish people for announcing they are running for president too soon. But to run a grass-roots campaign you need a longer runway,” said Chaudhary. Not everyone admires Warren’s early moves. 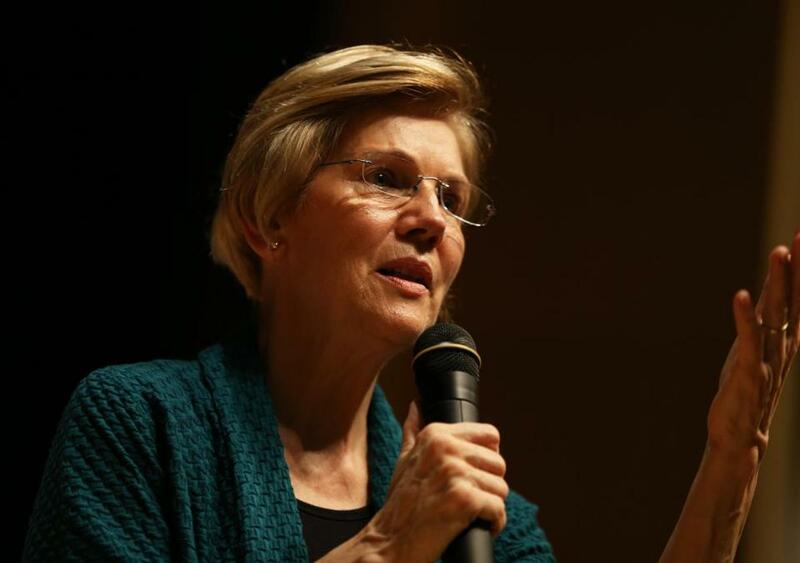 “It’s clear that Senator Warren is taking Massachusetts for granted,” said Holly Robichaud, a spokeswoman for Geoff Diehl, Warren’s Republican opponent for the Senate seat in Massachusetts. Diehl’s campaign recently sent out a news release blasting Warren for placing a series of online ads in Oklahoma, a move that also confused some Democratic strategists. “Wrong state, Senator,” said Diehl in the release, in which he asked her to sign a pledge to serve out her six-year Senate term if she wins. In the last two weeks, the Globe and the Center for Responsive Politics analysis showed Warren has spent thousands of dollars trying to build an e-mail list in Oklahoma. The state had only 38 Democratic delegates in 2016 and is therefore not consequential in the Democratic primary race for the nomination. The Oklahoma Facebook ads reached as many as 500,000 people in the state in the last two weeks. In comparison, Warren’s ads in Massachusetts reached as many as 1.6 million people in the same time frame. That left some strategists wondering: Is she planning to announce her presidential bid from there? Is she planning a big rally in her home state? Aides to Warren said the ads were timed to coincide with a public trip she made to the Sooner State state in late September. But Warren’s team doesn’t typically buy online ads when she travels out of state — which she does often. If Warren does formally consider a run for president, there would be some paperwork involved before repurposing the e-mail list for a national run: She’d have to create an exploratory committee that would pay her Senate campaign fair market value for the list, according to Christian Hilland, a spokesman for the Federal Election Commission. Warren’s camp says a large e-mail list will be useful whether or not she decides to run for higher office. That’s because Warren tends to weigh in on national issues and does not shy away from using her list to nudge senators — even in her own party — in her direction. “It’s one tool we use to fight for working families and communicate about policies that affect working families so we can make real change,” said Kristen Orthman, a spokeswoman for Warren. Warren also uses her e-mail list to raise money for other Democrats; she has sent out fund-raising missives to her list on behalf of dozens of others. Annie Linskey can be reached at annie.linskey@globe.com. Follow her on Twitter @annielinskey. Nihal Krishan is a researcher and staff writer at the Center for Responsive Politics.